This is a low-poly game-ready 3D model of a fire/water pillar, depending on the texture used. Software: Originally created with Blender 2.77a and rendered with Blender Cycles. Usage: This model was designed for use as a real-time asset in a videogame or simulation. Included in the Pillar_Textures.zip file. 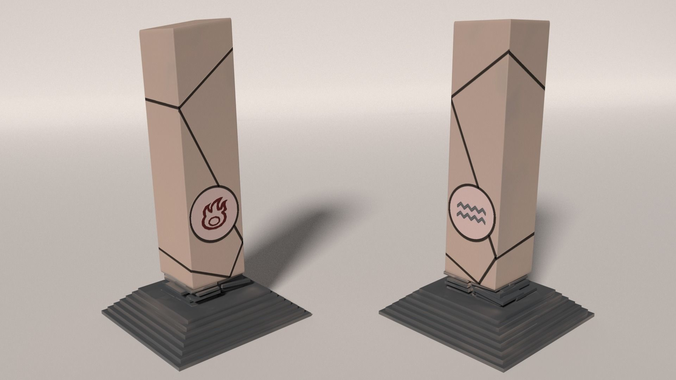 For both fire and water, I have a light texture and an alternative darker texture, as you can see from the presentation images, as well as a mask texture, in case you want to make the symbol, circle and lines to glow, if the pillar is activated. Also included the fire and water symbol, both in .svg and .png format. All textures are in .png format. Main textures' size: 2048x2048.